The body of a notorious kingpin identified as one Papa Morino Monday, was found along Parliamentary Extension Calabar, Cross River State. The body reportedly had machete cuts and stab wounds. 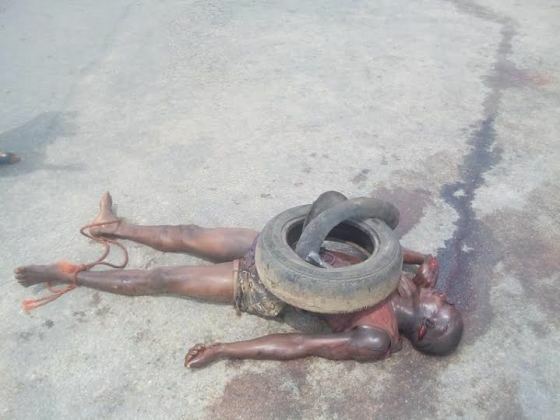 His legs were tied with ropes and around his neck hung car tyres which seem to indicate that he was set ablaze. According to Cross River Watch, Morino was until his death, a member of a dreaded armed robbery gang that has been terrorizing the neighborhood for a long time.